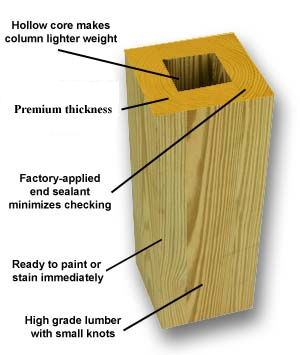 YellaWood® Porch Posts (Columns) are KDAT! YellaWood® KDAT Pressure Treated Porch Posts provide exceptional durability and strength at a very attractive price, and the hollow core provides increased structural stability and lighter weight versus solid timbers. NOTE: Posts may be up to 1/4" larger than listed Actual size. 3. Actual length is 1/2" shorter than stated above.